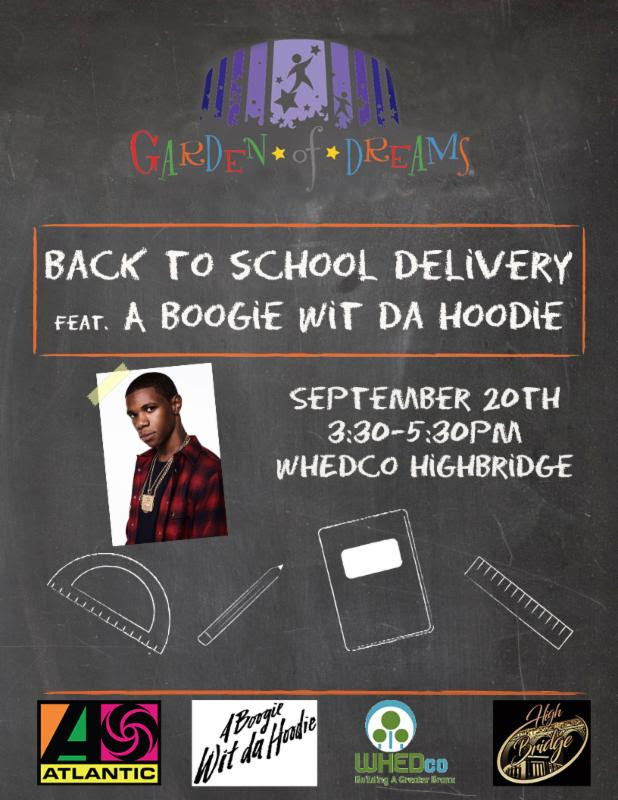 Rising hip-hop superstar A Boogie wit da Hoodie has announced he will be partnering with the Garden of Dreams Foundation in conjunction with WHEDco (Women's Housing and Economic Development Corporation) in the Bronx for a back to school giveaway that will take place on this coming Wednesday September 20th. A Boogie will be giving kids in need school supplies from book bags to composition books while interacting, taking pictures and signing autographs for the duration of the event,benefiting his hometown, the Highbridge neighborhood of the Bronx. The partnership with Garden of Dreams comes days before the 21-year-old releases his highly-anticipated debut album THE BIGGER ARTIST dropping on September 29th via Atlantic Records. young artists to watch garnering a spot in the XXL 2017 Freshmen class and featured coverage from the New York Times, FADER, COMPLEX and more. At 21 years of age he has put New York on his back with infectious music that is tapping the vein of the culture. His hit single "Drowning"